Our work touches more than physical buildings; we strive to create communities, foster friendships, and make a difference. Last Friday, December 15, our office in Atlanta hosted an event that checked all three of those boxes, and helped make the holidays a little brighter for children throughout Georgia. 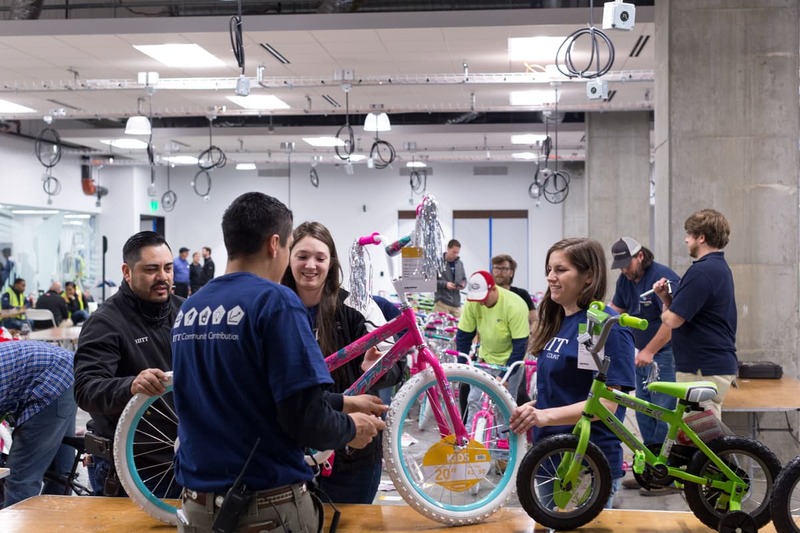 Dubbed the Big Bike Build, the event brought together several of the organizations currently managing construction of NCR’s new Midtown headquarters in support of one common goal: to build 864 bikes for Toys for Tots. When presented with the idea, our Client, owners, subcontractors, and partners didn’t hesitate to get on board, donating their time, resources, and talent to the project. On the day of the event, more than 200 people converged on the NCR jobsite, taking turns assembling bikes, inflating tires, checking work, and tying a bow on each finished product. By the end of the day, we built 1,006 bikes, but the generosity didn’t stop there. In addition to the bikes, the team presented the Atlanta chapter of Toys for Tots with a check for $25,000. We are very proud of what our team accomplished with the Big Bike Build. Thank you to our partners at Cousins Properties, NCR, Jones Lang LaSalle, Holder Construction, Gensler, iTelNetworks, Kimley-Horn, Uzun + Case, Anning-Johnson, HKS, The Stonhard Group, On-Site Woodwork, Convergint, Lucent Glass, NCI, Allison-Smith, Vision Flooring, Arch-i-Tech, McKenney's, Specialty Finishes, Advantage Fire, Manning Brothers, FLIK, TurnerBoone, NetPlanner, AJ Glass, G&T / Final Clean, Accu-Tech, Code Compliance Services, AHA, MOSS, Blinds & Designs, Big D Metalworks, Walmart, and Peachtree Bikes—for bikes as it is for buildings, we couldn’t have done it without you.